OAKLAND — The jury has reached a verdict in the murder trial of journalist Chauncey Bailey and two other men. The verdict will be read at 12:15 p.m. in the case against former Your Black Muslim Bakery leader Yusuf Bey IV and bakery member Antoine Mackey. 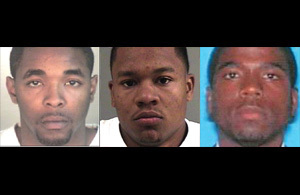 The men are facing triple murder charges in connection with Bailey’s death and the unrelated shooting deaths of Odell Roberson and Michael Wills in summer 2007. Bey IV and Mackey, both 25, have pleaded not guilty. They face life in prison without the possibility of parole if convicted on all charges. The jury of seven men and five women began deliberations May 23 after nine weeks of testimony from more than 50 witnesses. Bailey, 57, editor of the Oakland Post, was gunned down Aug. 2, 2007, on his way to work in downtown Oakland. The man who confessed to killing Bailey, bakery member Devaughndre Broussard, told officials that Bey IV ordered the death to stop the journalist from publishing an article about the bakery’s financial troubles. Broussard accepted a plea deal in exchange for his testimony and is expected to be sentenced to 25 years in prison. Broussard also confessed to killing Roberson, a 31-year-old homeless man, on July 8, 2007, which he again said was on Bey IV’s order. That killing, Broussard said, was retaliation because Roberson was related to a man convicted of killing Bey IV’s older brother. Attorneys for Bey IV and Mackey aggressively attacked Broussard’s credibility, calling the 23-year-old a liar who would say anything to avoid spending the rest of this life in prison.